The recent “Moment of Truth” (#MOT) event in New Zealand featuring Edward Snowden, Julian Assange, Glenn Greenwald, Kim Dotcom, Robert Amsterdam and Laila Harre is best understood when viewed from multiple perspectives. There is of course, the perspective of the beleaguered and scandalised NZ mainstream media, with which most are by now familiar. There is the perspective of new media activists like myself and others, well-schooled in #GCSB-related issues from a first person context, present at the Auckland Town Hall event to eye-witness and document this slice of political history, of social evolution. 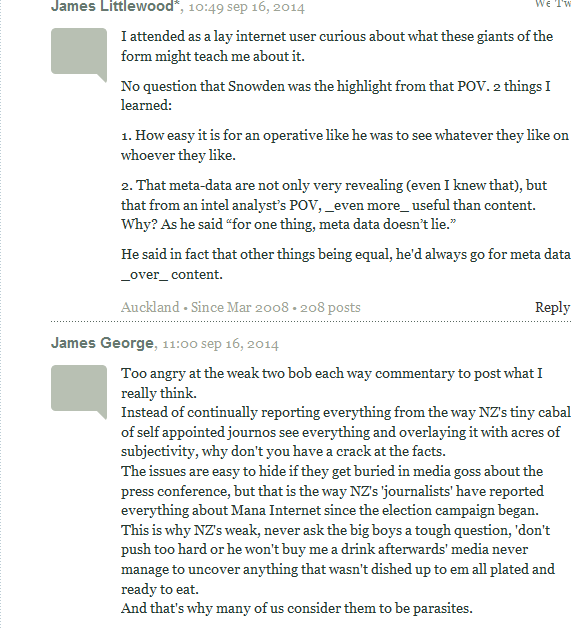 Most importantly, there is the seldom-aired and oft-forgotten perspective of the non-politically-aware average Joe and Jane Bloggs Kiwis, who knew little or nothing about the GCSB prior to the Moment of Truth but for whom the massive media maelstrom that surrounds everything Kim Dotcom had penetrated enough to pique their interest and lead them to the livestream on the night. In conversation with a couple that fits just that description, valuable feedback is gleaned that had not been anticipated. 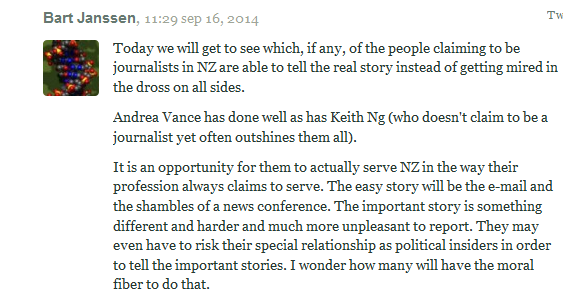 “You know me, I never get into politics”, said Jane Kiwi (name changed to protect identity). “But I actually watched the livestream last Monday night”. To say Jane doesn’t “get into politics” is an understatement. She frequently hushes others when they attempt to discuss it. Too controversial, and as the old adage goes, not a topic for polite company. A primary school teacher and mother of infants, Jane is a classic case of not having the time or inclination to invest herself in matters beyond her immediate surroundings and concerns. But watching the stream, Jane soon found herself confused. To paraphrase; “Not understanding much of what Greenwald said made it feel like he spoke for too long. We knew John Key had called him a loser and how embarrassing that was, but I didn’t understand most of what was said that night, so the parts I did understand being about John Key made it come off as self-aggrandizing”. She greatly enjoyed seeing Snowden and Assange on the big screens but confesses to have comprehended little if any of what was discussed. “We just don’t know why we have the GCSB. It makes no sense” she says. Another complaint was Kim Dotcom’s mic volume on the stream. While not at all a noticeable issue from within the Hall, Jane says it was too loud in the mix, leading to a perception Dotcom was cackling throughout. Indeed at the close of event, the guest mics were all left open – allowing those departing the Hall to hear the backstage conversations of Dotcom, Greenwald and Harre. Tellingly, the conversation overheard was the aforementioned noting to one another how wonderful the audience response had been, and how great they felt the event had gone, which was also my experience on the night. However the rash of open-mic-incidents in recent times does raise question as to whether the open mics were malicious or purely accidental. So what would have helped Jane to understand? If a group of the most intelligent men on the planet proving, at a highly technical level, how our government intelligence apparatus has been turned on us, couldn’t? For although Jane has occasionally heard about the plight of Edward Snowden on TV, she has been too busy changing nappies to read Greenwald’s “No Place To Hide“. She will probably never read The Intercept’s articles on the New Zealand revelations. She has no idea how to explain what is happening to school children. But she has this nagging feeling in the pit of her stomach that something is not quite right. Larger forces are at play in her country and to undesirable effect. Although she has little grasp on who or what that is, she innately knows that somehow, she is a tiny part of the antidote. If only she knew how to take the first step. Jane is looking for answers. Answers that, truth be told, take countless hours of research to be able to get near. But that is just not within the reach of much of the population. So Jane needs to have it explained to her in much simpler terms. While not specifically about mass surveillance, Edward Snowden, Assange or Dotcom, this short animated video about the basic elements of liberty instantly springs to mind as a type of teaching tool that is accessible to most members of the public. Jane is not a terrorist. She is a middle class white female from the suburbs who has, through mainstream coverage of Snowden’s revelations, discovered that for her entire adult life she has been routinely driving past an NSA station in the middle of Takapuna, an upmarket beach-side suburb of Auckland’s North Shore. Largely dismayed by recent political events, she is among the last demographic of Kiwi consumers to realise that the mainstream media might not cover events with her best interest in mind, but their own instead. Having been taught her entire life to view politics as a left-right spectrum, it has never occurred to Jane that there might be alternatives to the current paradigm other than to swing between voting red and voting blue. She is further disillusioned by #DirtyPolitics: a book full of despicable people and despicable acts and too few characters with whom she can relate to, in order to identify and empathise with them. The barrier that raises prevents her from seeing herself as a victim of privacy intrusion; a concept which remains stubbornly foreign, despite concerted assertions to the contrary from those she speaks with. To even begin to think outside the box Jane has been brought up in, she needs not only seeds of inspiration and the time to contemplate and form new ideas, but also holistic support at her level of understanding. This is not something readily available via the mainstream, nor within the esteemed circles of academics, researchers and talking heads on the speaking circuit. If only Jane had a button on her browser that translated geek speak to colloquial Kiwi lingo; political engagement would inch that must closer to her realm of possibilities. The performance of the proverbial Fourth Estate at #MoT was entirely predictable however is on another level when witnessed first hand. It was patently obvious from seeing NewstalkZB political editor Barry Soper camped out at the very rear of the hall that the media pack were there to relay sensation, not to pay attention. But to listen to establishment journalists openly colluding over angles at the end of the event was next level. “I’m going to say it was a fizzer”, declared one extremely well-known New Zealand journalist. “Yeah, me too” said another equally recognisable stalwart. This, after an event where the public had stomped the floor in appreciation so loudly and vigorously that we thought the floorboards would break under our feet. Where standing ovation after standing ovation took place, where poor Edward Snowden had to interrupt the audience’s protracted applause for him, in order to be able to speak. An event at a venue filled to capacity, with another capacity crowd regrettably turned away. An event where 200,000 people watched the livestream in the first 24 hours. Even more embarrassingly, these journalists, many of whom consider themselves to be “new media” and expert at media analysis, made their boasts and backslaps while standing right beside a REAL journalist – one who they didn’t even vaguely recognise. With global reach and ten times the followers of the “fizzer” conspirators, Tim Pool is the quintessential new media journalist and innovator – a fearless firebrand far beyond the imagining of the establishment New Zealand media. Not only was Tim one of the first Occupy Wall Street livestreamers, broadcasting epic live footage to the world in up to 21-hour stints during the evictions, but he has spent the years since continuing to relentlessly cover, worldwide, what the mainstream media don’t. From New York to Istanbul, Chicago to Los Angeles to Ferguson, Missouri, Tim has been shot at with rubber bullets, tear-gassed, arrested, and followed in the pursuit of real journalism. To see him in New Zealand was exhilarating. Indeed it is. 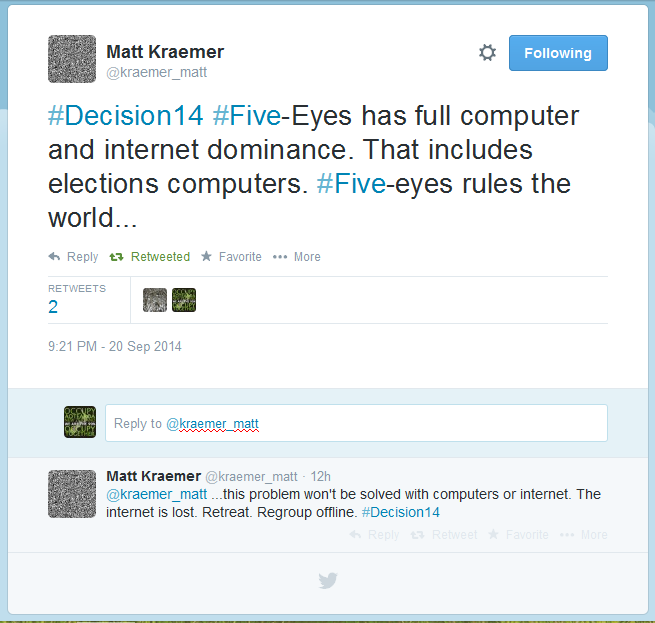 After weeks of #DirtyPolitics lead-up, the “Moment of Truth” broke into the international media in a huge way. Despite this, the New Zealand mainstream media continued to target Kim Dotcom in precisely the same way warned about in Nicky Hager’s book. At the press conference backstage after the event, they appeared to spontaneously and collectively obsess over an email related to Kim Dotcom’s case, conveniently forgetting to ask questions about the Snowden revelations or Greenwald’s reporting. Finding himself in the uncalled-for situation of being grilled about Dotcom’s business rather than actual journalism, Greenwald remained polite under fire. In this unedited video shot live, the tail-end of the media frenzy can be seen. After Greenwald politely deflects their irrelevant and inflammatory questions by explaining what he is there to talk about and why, the media continue to yell questions unrelated to Snowden at the panel, prompting Dotcom to call them out on their relentless bias, to their faces, and end the press conference. Apparently Russell Brown from the often-friendly sometimes-fence-sitting NZ blog PublicAddress was apparently not at the same press conference. For he wrote of the incident, “no one else could be such a dumbass as to undermine the event in the way Kim Dotcom did”. That the entire mainstream media had Glenn Greenwald sitting in front of them, waiting to answer any question they had about mass surveillance, New Zealand’s role in it and Snowden’s revelations, and instead chose to attempt to saddle him with baggage from the ongoing Dirty Politics anti-Dotcom vendetta, is a travesty. In contrast and no doubt to Russell’s chagrin, the over 500 reader comments on his article are by-in-large from wide-awake citizens openly discussing the media’s position with a deep level of understanding and no shortage of very-Kiwi sardonic humour. There was nothing more torturous (other than initial confusion over whether I could get a media pass to cover the event?!!) than having a thousand questions to ask Glenn Greenwald and not getting to ask any of them. Which is why I was overwhelmed with joy to see Russell Brown soon redeem himself with this interview with Greenwald. 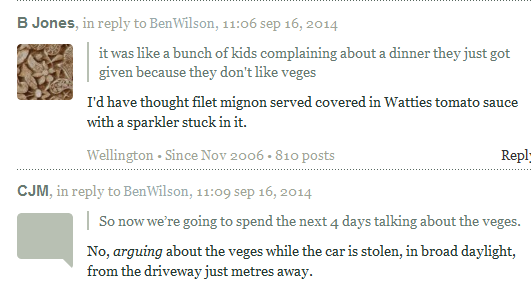 While still dragging Kim Dotcom into it, Brown actually does manage some good questions and this is reflected in the comments section, which is far less vitriolic and even congratulatory of him. “At the end of the day” (inside joke for Kiwis) people recognise truth when they see and hear it. They understand the difference between the real and the manufactured. While they can be lulled into sloth they are not so easily lulled into disbelief when confronted with experiences and conversations that they inherently understand are rooted in fact. Whether or not they can grasp the intricacies or know how to place themselves in the picture yet. Having living legends like Snowden, Assange and Greenwald appearing in Auckland will have begun that process of change for many people, as the issues become more real to them and less whimsical figures of their imagination. The scale of the awakening is now such that there is no longer any single person, even Kim Dotcom, on whom the future of this country is reliant or can be swayed. The people want and are demanding answers. All of us will equally carry the responsibility for the security of our future generations on our shoulders and it is only a spirit of unity that will overcome any challenge. Last night the General Election results were posted and updated live at the official New Zealand Government Elections website. Defying statistical probability, the standard of deviation in the party votes was ~1% for the vast majority of the count, after a fall of a few percentage points at the very beginning. A lack of exit polls deprives us of any meaningful way to measure the veracity of the result. While the mainstream media made much of the efficacy and safety of using “paper ballots” in the lead up to election night, the data being updated on the Government website clearly had a point of entry and left some Kiwis wondering what we have really just witnessed. Kim Dotcom, however, has been gracious in defeat; extending a gentlemanly congratulations to Prime Minister John Key and taking responsibility for the loss. While admirable of him to do so, the #DirtyPolitics script was very clear about who was responsible for the anti-Dotcom smear campaigns and which members of the mainstream media participated in them. All of the mainstream journalists implicated in the scandal closed ranks and remain employed and operational to this day, and indeed are bragging and victim-blaming on social media as I write this. Let New Zealand never again be called the least corrupt country in the world. For we are not. Our government is an international embarrassment, newly empowered to run amock for another three years.